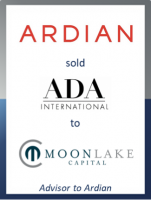 GCA Altium acted as exclusive financial advisor to Ardian and the management team of ADA International, the European market leader in premium hotel amenities, on its sale to Moonlake Capital. Headquartered in Kehl, Germany, ADA supplies over 25,000 hotels globally with premium amenities. The company has a wide range of licensed renowned luxury brands and proprietary lifestyle brands, which are sold through ADA’s product portfolio of tubes, flacons, sachets, soaps and dispenser systems. ADA has production facilities in Germany, the Czech Republic and Malaysia, where it mixes and fills the respective liquids and produces soaps. Over the past years, ADA has shown healthy organic growth and successfully established a buy-and-build strategy, making it the undisputed European market leader and one of the top 5 companies in the sector globally. Ardian acquired the company via its Expansion Fund III in 2014. Since then, the business has grown via a buy-and-build strategy through the acquisitions of Scandinavian Amenities, Pacific Direct and RDI Malaysia, as well as through significant organic growth. Under Ardian’s ownership, sales have more than doubled to over EUR 110m with profitability increasing steadily. The customer base has grown from around 15,000 to over 25,000 hotels, and the workforce has doubled to around 700 employees. Sascha Pfeiffer, Managing Director at GCA Altium, added: "Our repeat client ADA Cosmetics has been an outstanding value creation story in the German private equity market and has substantially grown in size having almost quadrupled revenues since its first MBO in 2006. We are very proud to have been part of this journey for many years and are delighted to announce the quaternary buyout of the business sponsored by Moonlake Capital. I am very much convinced that ADA’s management team will continue its success story under Moonlake Capital’s ownership." GCA Altium acted as financial advisor to Ardian and the management team of ADA. The transaction was signed in October 2018 and is subject to customary closing conditions. Terms of the transaction were not disclosed.